So for the first time since having children we’re pretty much tied into school holidays. Whilst our daughter doesn’t start school until next September (2018) she is at a term time only pre-school. With the Easter holiday looming we started thinking about what we might do and where we might go. I quite fancied Scotland but I struggled to find reasonably priced accommodation and when I then stumbled (or searched?!?) on cheap flights to Porto I settled on that. Portugal has the added bonus that during the U.K. Summer time there is no time difference so children adjust easily. Flights (2 adults, 1 child and an infant). Manchester to Porto with EasyJet – £330 (including three hold bags). Total – £687 (so cheaper than the accommodation at Center Parcs!). Once in Portugal we found it ridiculously cheap. We struggled to spend more than 4€ on a nice bottle of wine (yummy Vinho Verde!) in the supermarket and food is also very cheap (for example 3 ice creams in an artisan ice cream parlour only set us back 8€). I promise we ate proper food as well! So, as usual, we settled on an Air B and B. We really do find staying in an apartment and mostly self catering (I say mostly because it gives us the choice to go out if we want to!) by far the easiest and most enjoyable way of holidaying with young children. I also love cooking using beautiful local ingredients, so it’s a win win situation. The apartment we chose in Porto was ideally located, an easy 5 min walk from Bolhao market (ideal for shopping) and metro station and a slightly more strenuous walk of around 10 mins from the main sites (although I have to confess we mostly took an uber). The apartment was really well equipped, 2 large bedrooms, a balcony, a large open plan kitchen/living room (that much to my delight had a dishwasher and washing machine!) and a small but perfectly adequate shower room. It also had wifi so ideal for lazy nights in and for Netflix for our toddler! Possibly the best feature of the apartment was the blackout shutters (why don’t we have them here!?!) that ensured that we all (yes all) had unbroken (well almost!) sleeps. Top Tip: Live like a local, book an apartment through, this link for £30 travel credit with Airbnb and we get a little something off our next booking too, enjoy! The weather was unexpectedly hot during our stay (not that we were complaining!). We had 4 full days and spent 3 of those in a park and or on the beach (it’s a hard life!). I’ll say more about our day site seeing in a sec. Easily accessible via metro from central Porto (it cost 3€ return and the children were both free). It’s also on the tourist bus route (although we found this a pretty awful experience). The beach is Porto’s main beach. It’s modern and well equipped. There are plenty of beach side bars, cafes and restaurants and 2 supermarkets for picnic supplies. 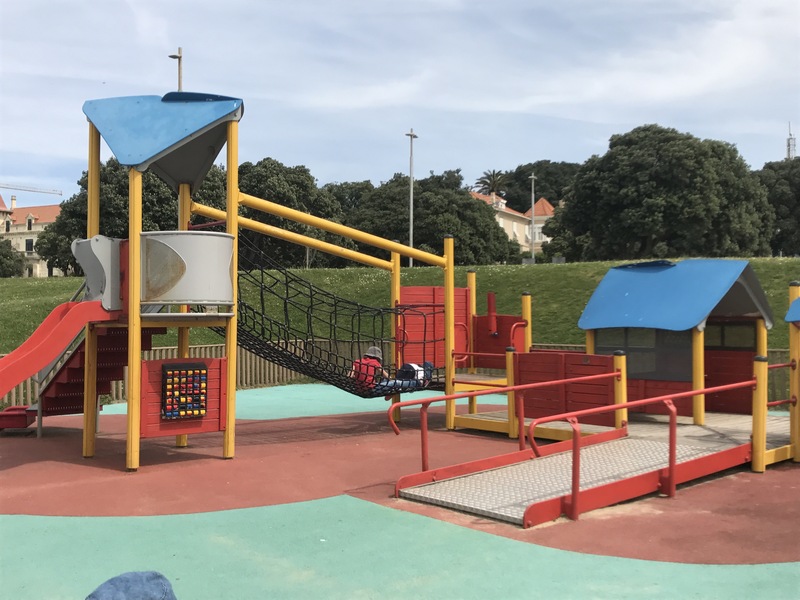 There was also a wondeful little play park (near the tourist office) on the beach so everyone found something they liked. At the far end of the beach (again near the tourist office) there is a ferry terminal, which provides another form of entertainment for young children! There are toilets in the tourist information centre as well as in all the bars. 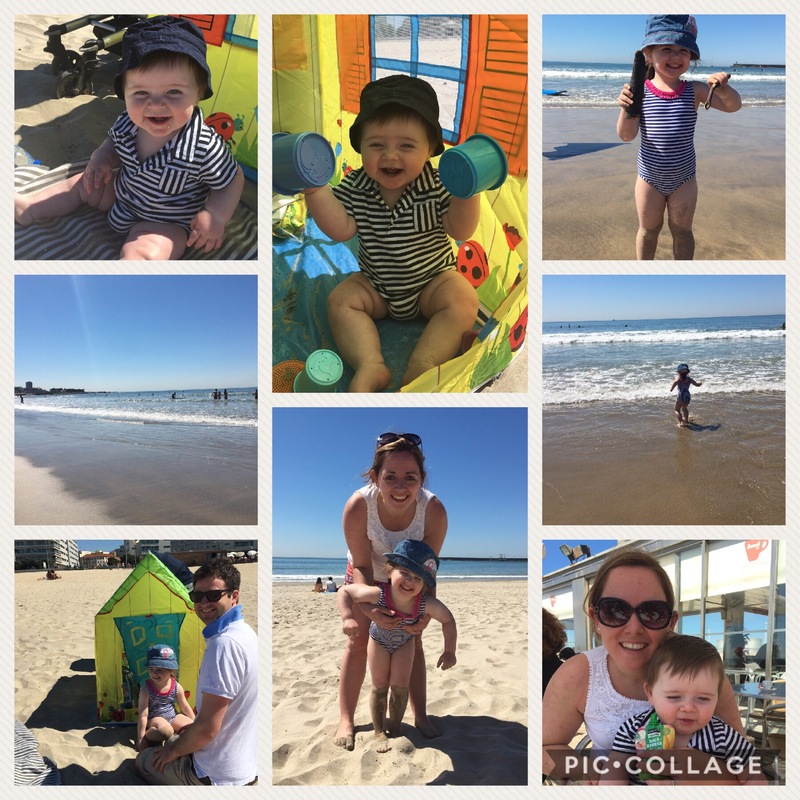 The beach is a very open expanse of sand, quite unlike other beaches in Porto (more about that below) – ideal for little ones. There was plenty of space for running, digging and playing! Older children may enjoy having a surf lesson (there seemed to be plenty of surf schools serving the beach). The only thing it lacked was any sort of beach shop. We, having not really anticipated such beautiful weather, hadn’t packed our beach sun shade. We couldn’t find anywhere to buy a cheap parasol so we ended up buying a pop up house in one of the local supermarkets (my mum nicknamed it a beach hut…sounds classier than it was!). Mental note to always pack my pop up beach shade! On our last full day I fancied seeing another beach (I really do get restless seeing the same thing more than a couple of times when on holiday!). Molhe Beach was much harder to reach from our apartment (we ended up taking the yellow tour bus (more about that below! It was a nightmare!). This beach wasn’t as good for children as Matosinhos (in our view). The beach was far more rocky and there was therefore less space for playing (although great for climbing and rock pooling). It generally felt more tired and less well equipped. 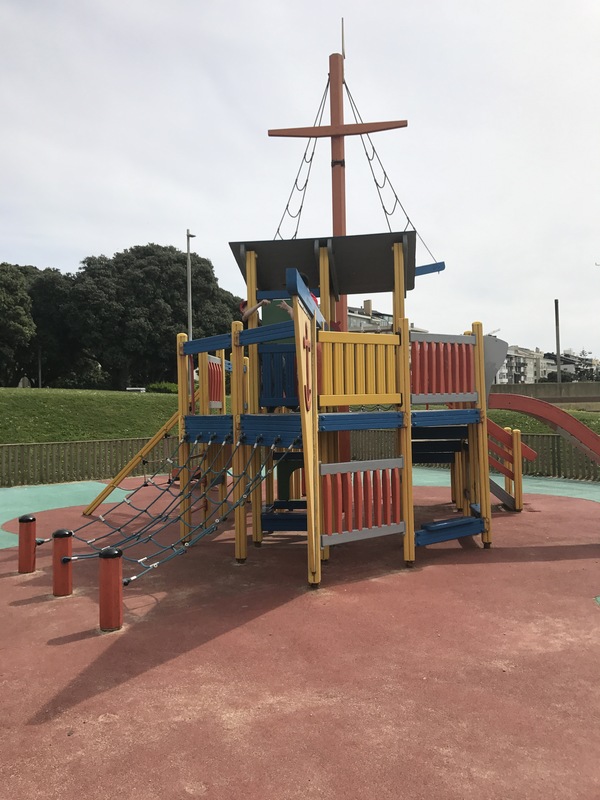 That said, we did stumble across a wondeful play park (next to a nice looking bar/restaurant) which our daughter absolutely adored – so it wasn’t a wasted trip! As an alternative to a day at the beach (I did just say I get restless!) we opted for heading to one of Porto’s wondeful parks. The Jardins do Palácio de Cristal boasts wondeful views over the city as well as a beautiful lake and plenty of secret, winding paths (most of which weren’t possible with the pram or scooter but hey!). There are some public toilets in the park and these were clean and had baby changing facilities inside the ladies (why can’t they be in the men’s as well?!?). We all enjoyed a gentle stroll around the park and a picnic in a shading spot. It was a complete delight to be able to shop here for ingredients for our dinners and lunches. Every morning my daughter and I would set out on a mission to pick everything up for the the day. We’d go with no real sense of what we’d eat but instead look around and see what looked good. We are very blessed that where we live at home (in Alcester, Warwickshire) we are surrounded by wonderful butchers, vegetable shops, fishmongers and farm shops but nothing quite matches up to a large, covered market with the noise, the smells and the hustle and bustle during the morning rush. 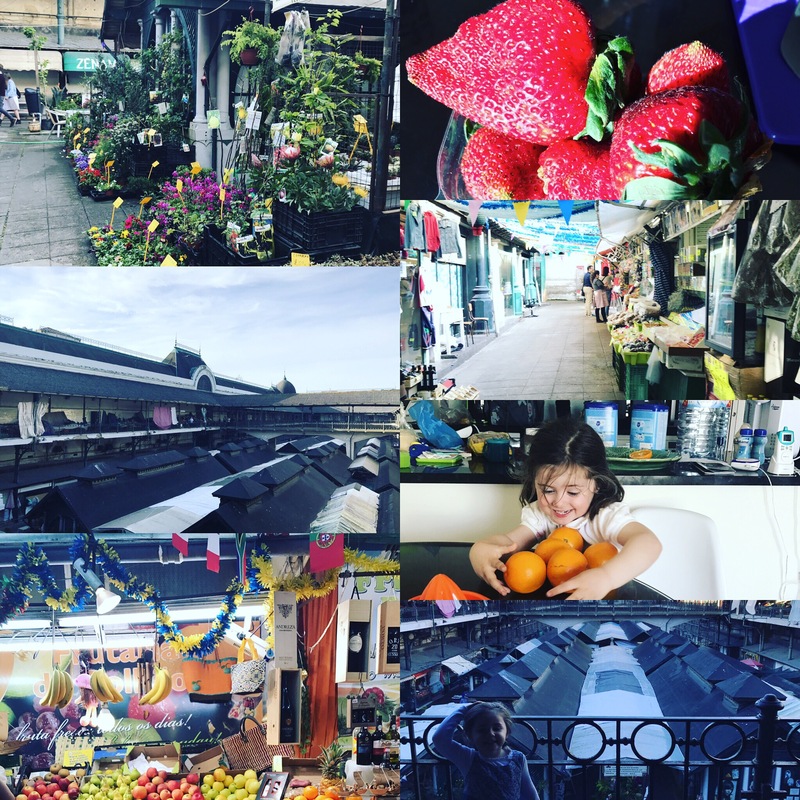 Our daughter was mesmerised by it all – particularly when a fishmonger dropped an live eel on the floor and then proceeded to chase the slippery thing around surrounded by squeals from elderly shoppers! (She’s still talking about it now!). Travelling, for us, is all about exposing our children to new and memorable experiences….this market certainly provided on both of those! The market was surrounded by wonderful pastry shops (not the place if you’re on a diet!) and we indulged in custard tarts and many other beautiful treats throughout our stay (our favourite was Confeitaria do Bolhao. I highly recommend it! I’ve given this its own section largely because it will give you a sense of what we managed to do in one day with two children (aged 3 years and 9 months). We set off from our apartment at 9.30am, taking an uber to Sandeman port. This was the first holiday that we’d used uber and I have to say it was brilliant and took a lot of hassle out of our a city break with young children. We were able to grab a taxi from our apartment without having to track down the nearest rank and paid via paypal so no hassle with finding the right money and paying whilst also getting two children and a pram out of a car! Back to Sandeman. My husband’s ancestors were related to Sandeman (his granny’s maiden name was Sandeman) so we have long wanted to visit the port house. We arrived and waited 10 minutes for a tour in English (there’s no option to just walk around you have to take an organised tour). The tour was not really suited to little ones. Our 3 year old was fine and enjoyed taking photos and came out discussing the differences between red and white wine (it’s never too early to start right?!?) but our 9 month old was restless from the start (its quite dark in the cellar). I ended up sitting in the bar (its a hard life!) feeding him cheese sandwiches while my husband and daughter finished the tour. I did enjoy the port tasting that came at the end of the tour so it wasn’t all bad! Some would say I had a result. I am led to believe that the tour was informative and pretty enjoyable. 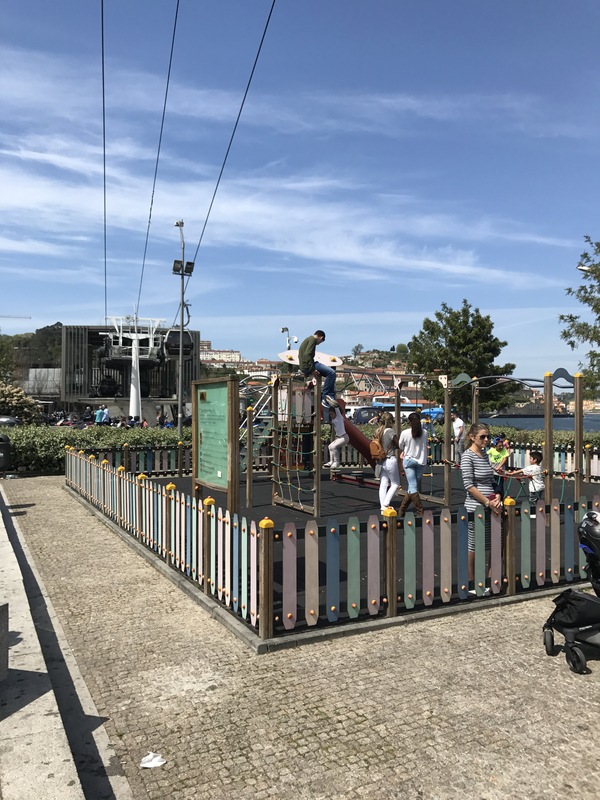 Just over the road from the port house, down towards the gondola station was a wonderful play park with spectacular views over Porto. After a play we took the gondola to the top of the of the Dom Luis I Bridge. The trip lasted no longer than 5-10 minutes but was well worth it. Not only did it save our legs (particularly important if, like us, you have a pram in tow!) it also provided wonderful views of the city and over the port houses. From here we strolled across the bridge, admiring the views and ensuring our daughter didn’t climb onto the tram lines that also ran across the bridge! 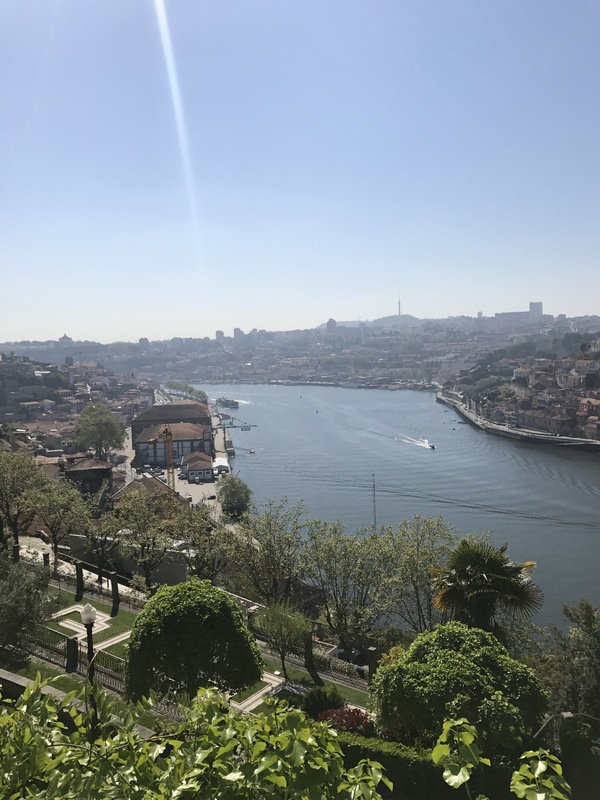 Once we reached the other side we took the Funicular dos Guindais down to the Ribeira and river bank and strolled along, soaking up the atmosphere and finding a restaurant for lunch. We enjoyed a lovely meal, albeit very touristy. Post lunch we started to head home, taking the funicular back up the hill and then walking the 10 minutes back to our apartment. We had a wonderful day and it was amazingly easy to navigate Porto with the children in tow. I often read blogs where people sing the praises of bus tours with young children. Porto is well served by at least 3 companies, all offering very comparable tours for the same sort of price (and they’re not cheap!). I haven’t used one of these hop on hop off busses for a long time (I think the last time I used one was in Budapest as a student!). We decided to give the bus a go on our penultimate day, mainly so we could get down to different beaches without having to use a number of different forms of public transport. We realised that the Yellow Bus Tour stopped very close to our apartment and settled on this one. We couldn’t see any mention of departure times online so we walked to the bus stop hoping to find some extra info there….no such luck. There was literally no mention of what time the bus was expected, in fact the bus stops were dereft of any useful information! We telephoned the main ticket line and they informed us that we’d have over an hour to wait! We decided to walk to another stop on another line…..again, no timings etc (and we checked the other tour bus companies as well – no mention of times for any of the companies). How strange. Had it just been my husband and I we would have bailed at this point but our daughter was mega excited at the prospect of a bus tour! We waited at the bus stop and eventually one arrived. If I’m honest, we really didn’t enjoy the experience with two children in tow – we couldn’t hear the tour guide and the other guests kept looking at us disapprovingly. The main issue however was that we couldn’t really use the hop on hop off function given that there was no information of times at individual bus stops. I’ve since checked our local hop on hop off bus company (in beautiful Stratford upon Avon) and each bus stop has times etc. So having said we’d never try one of these tours again we may be persuaded if they were better organised in other cities! Before I wrap this blog entry up (sorry its a long one!) I should say something about Porto airport. It is quite possibly one of the most child friendly places I’ve had the good fortune to travel through. 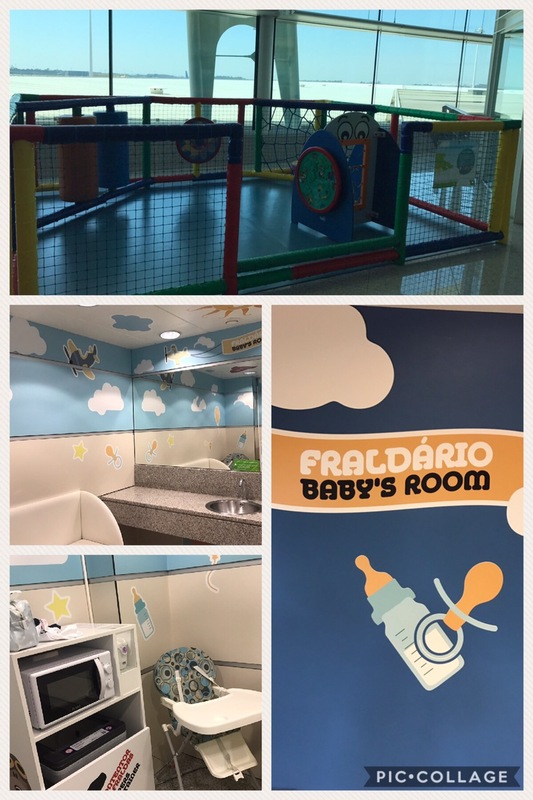 It had the most wonderful baby rooms equipped with microwaves, high chairs, bottle warmers, and changing mats as well as play areas scattered around the terminal buildings. There was even a grand piano with scheduled performances by professional musicians! Families were able to use the priority lanes at security and staff were very accommodating (even holding my son whilst I reloaded our bags!) If only all British airports could be like this! 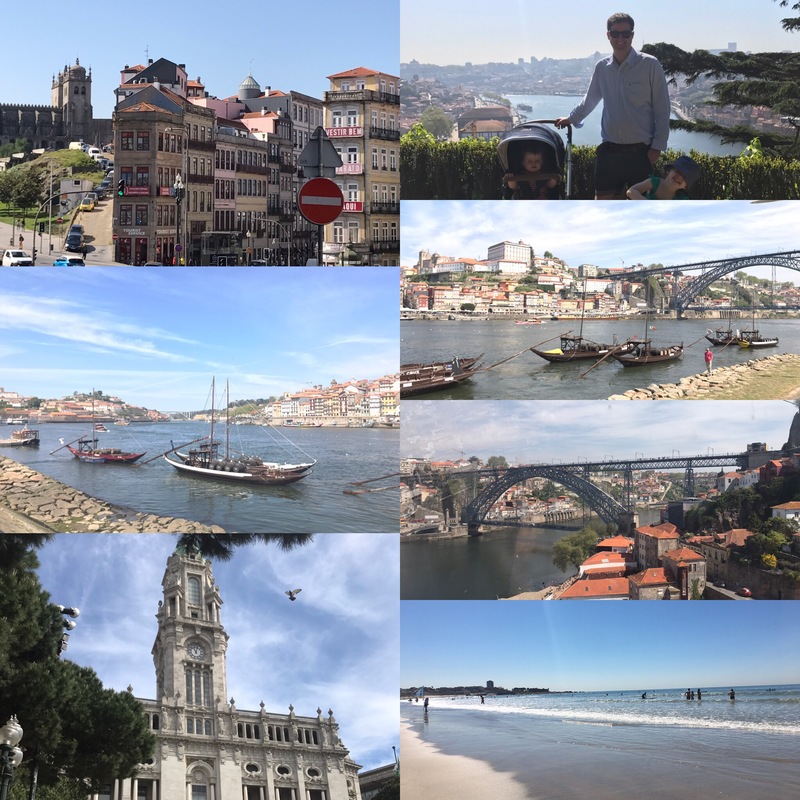 I highly recommend a trip to Porto (and Portugal quite generally!) – what more could you want from a holiday – wonderful weather, cheap accommodation and delicious food and drink. I’m going to find it hard to holiday in England when I can holiday in places like this for less money!